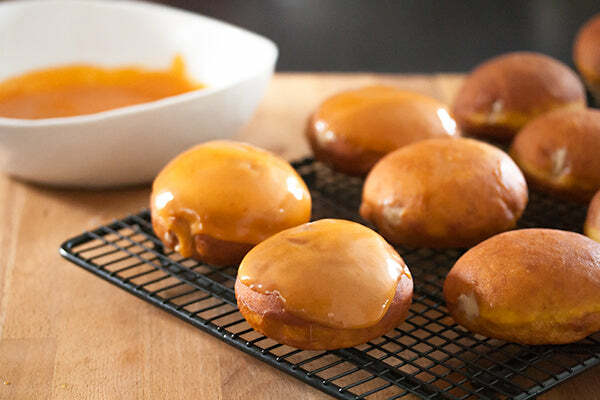 Forget trick or treat… these plump homemade doughnuts are all treat, with their combination of fluffy pumpkin-spice yeasted dough, sweet peanut butter pudding filling, and a bright orange pumpkin glaze. To transform them into jack-o-lanterns for your Halloween party, all you need is a couple of tubes of black gel icing and a steady hand. Decorated or not, these are sublime! 1. 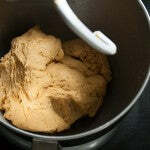 In the bowl of a stand mixer fitted with the paddle attachment, pour the yeast over the warm water and set aside for 5 minutes to proof. 2. 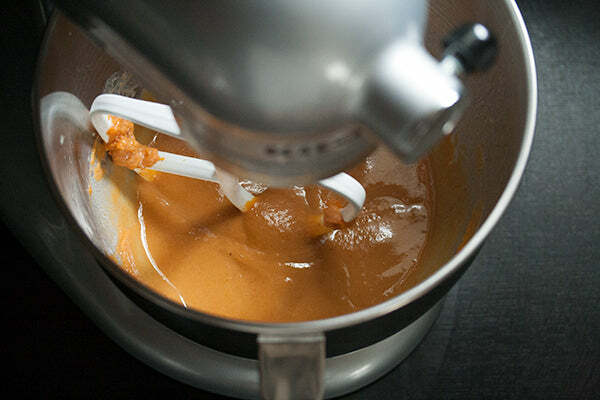 Once the mixture looks foamy, add the pumpkin, milk, brown sugar, butter and egg, and mix until smooth. 3. 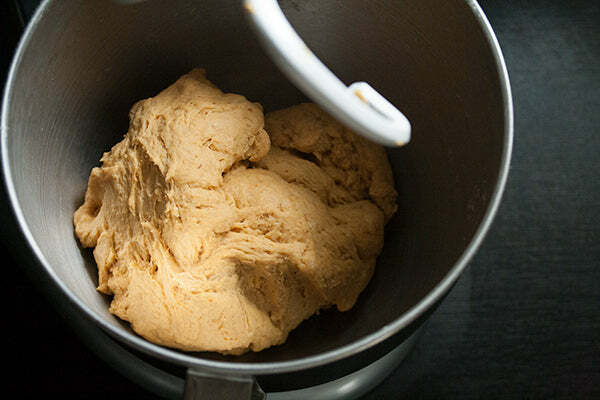 Switch to the dough hook, and add flour, salt and cinnamon. Beat on low speed until the dough starts to come together, then increase to medium speed and knead for 5-7 minutes or until you have a soft, elastic dough that pulls away from the sides of the bowl. 4. 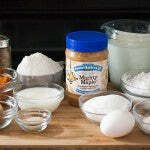 Shape the dough into a ball, and transfer to a lightly oiled bowl. 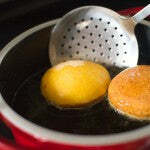 Cover loosely with a clean dishtowel, and place in a warm, draft-free spot to rise for 1 hour, or until doubled in size. 5. 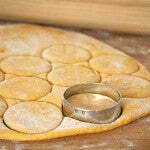 On a lightly floured work surface, roll out the dough to 1/2-inch thick. 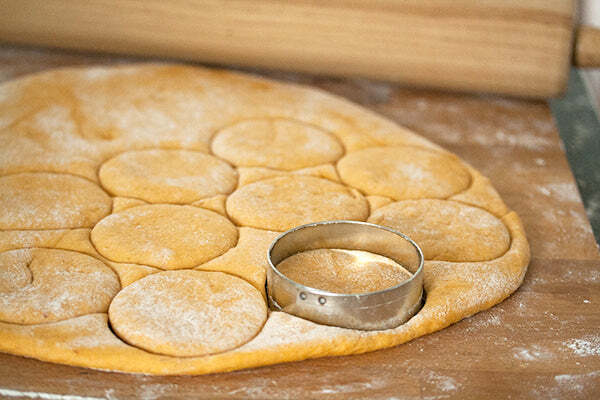 Cut out circles using a 3” round cutter, and arrange on a lightly oiled baking sheet. Cover with a dishtowel, and let rise in a warm, draft-free spot for 45 minutes, or until almost doubled. 1. While the doughnuts are rising, prepare the filling. 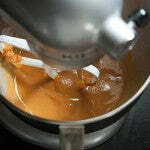 In a large saucepan set over medium heat, whisk together cream, sugar, cornstarch, and salt. Bring to a simmer and cook for 2-3 minutes, whisking constantly and scraping the bottom and edges of the pan to make sure the pudding doesn’t burn. 2. 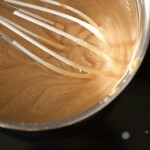 Remove from the heat and whisk in the peanut butter and vanilla extract. 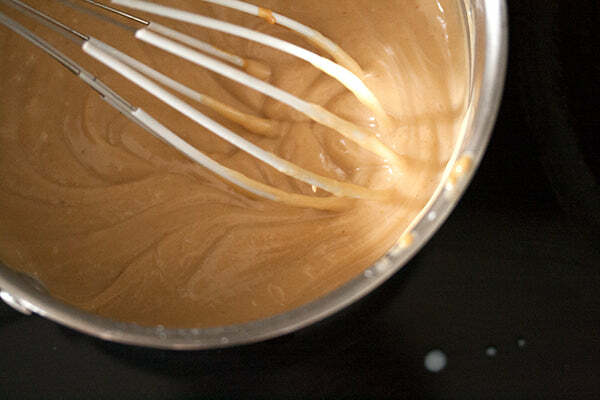 The pudding should thicken up enough to coat the back of the spatula. 1. Pour 2” of vegetable oil into a large heavy pot set over medium heat, and heat to 325°F. 2. 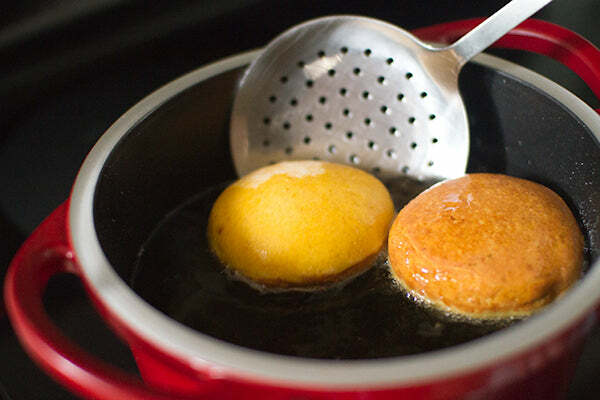 Working in batches of 2-3 doughnuts at a time, fry the doughnuts in the hot oil until golden brown on the both sides and completely cooked through on the middle. 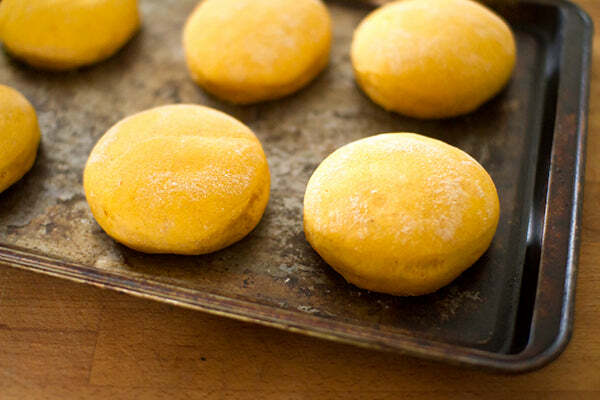 Place the finished doughnuts on a baking sheet lined with paper towels to drain, then transfer to a wire rack to cool off. 1. 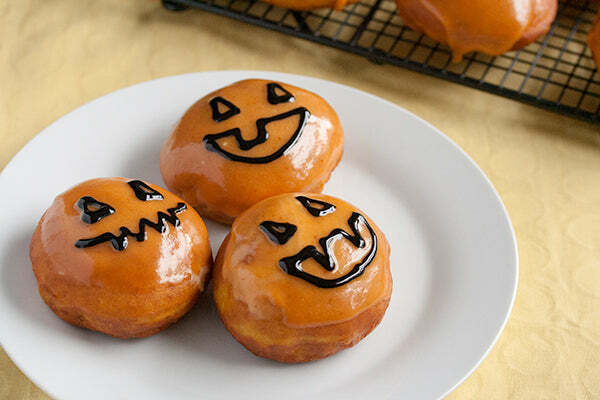 While the doughnuts are cooling, prepare the glaze by whisking together the icing sugar, pumpkin puree and cream until smooth. Set aside. 1. 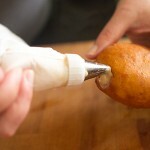 Once the doughnuts are completely cooled, spoon the pastry cream into a piping bag fitted with a large plain pastry tip. 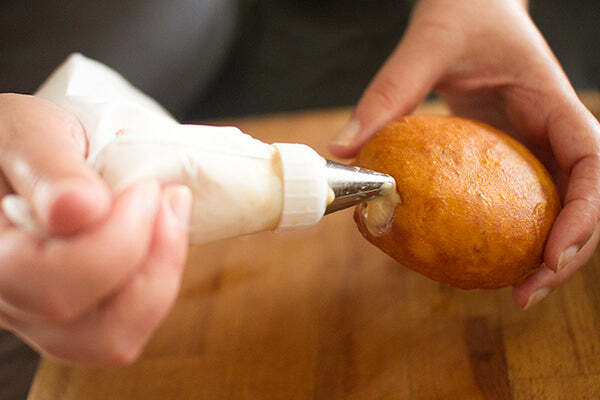 Push the tip into the side of the doughnut and gently squeeze a small amount (about 2 tablespoons) of cream, being careful not to overfill. 2. 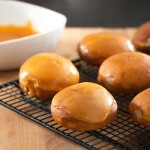 Dip the top of each doughnut into the pumpkin glaze, and allow the excess to run off before setting down on a wire rack. Let stand for about 5 minutes to allow the icing to set. 3. 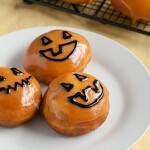 For a Halloween twist, use the icing pen to draw jack o’ lantern faces onto each doughnut, or simply leave them plain. Serve right away if possible (they taste best on the same day they’re made), or store in an airtight container for up to a day or two. Isabelle gets in the Halloween spirit by piping the inside of pumpkin doughnuts with a peanut butter filling, covering them with an orange frosting, and piping black icing on them to resemble jack-o-lanterns. 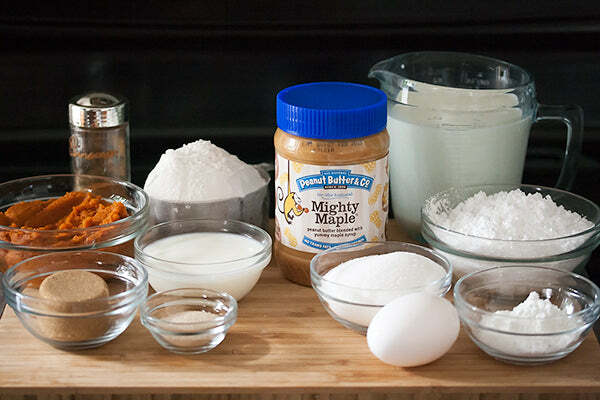 In what other ways can you combine pumpkin and peanut butter for Halloween treats? – The giveaway is open to USA residents only and will run until Monday, November 4, 2013 at 11:59 PM EST. – Winner(s) will have until 11/07/13 to claim their prize or we will choose another winner. 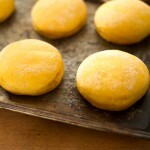 The post Pumpkin Doughnuts with Peanut Butter Cream appeared first on - Peanut Butter & Co. Recipe Blog.